New guidance by The National Institute for Health and Care Excellence sets out recommendations for NHS treatment be available on the NHS for thyroid cancer patients. Thyroid cancer accounts for 1% of new cancer diagnoses per year, Cancer Research UK reports. The National Institute for Health and Care Excellence makes a recommendation for treatment to be routinely available on the NHS. Thyroid cancer is comparatively rare. There are about 3,400 new cases in the UK every year, according to Cancer Research UK, accounting for 1% of all new cancer diagnoses. Of patients diagnosed in England, 85% survive for ten years or more. Differentiated thyroid cancers (DTCs) account for nine out of ten cases, while medullary thyroid cancer (MTC), which can be inherited, is more rare. 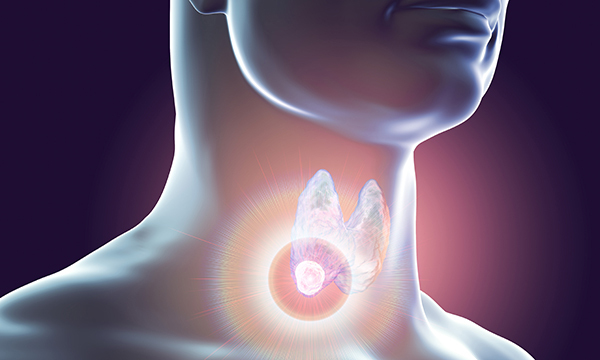 The National Institute for Health and Care Excellence (NICE) has published guidance recommending that a drug for treating thyroid cancer should be routinely available on the NHS. Cabozantinib is recommended for treating MTC that is inoperable or which has spread. Lenvatinib and sorafenib, two drugs for treating DTCs that have continued growing or spreading after surgery and radioactive iodine therapy, are the subject of separate NICE appraisal. Guidance is scheduled for August, following consultation. NICE says if all three drugs are eventually approved for routine NHS use, about 1,300 people could benefit over the next five years. A lump at the base of the neck is a possible indicator of thyroid cancer, although thyroid lumps are common and only 5% are caused by cancer. Hoarseness, difficulty swallowing and a sore throat lasting several weeks are among other signs and symptoms. Cancer Research UK says MTC can cause unusual effects, such as facial flushing and frequent loose bowel movements. In most people, the causes of thyroid cancer are unknown. It is more common in women and Macmillan Cancer Support says people who are overweight may be at higher risk. An estimated 1% of UK cases are caused by ionising radiation, according to Cancer Research UK. Thyroid cancer’s rarity means that diagnosed patients may need signposting to sources of support and information. The effects of thyroid cancer can give rise to communication issues if the patient’s voice is affected. Nurses should also be mindful that swelling around the neck can affect self-image and cause distress to the patient. 'Thyroid cancer is rare and most cases can be successfully treated, so those with metastatic or advanced thyroid cancer are small in number. But for people trying to seek information and link up to peers going through the same thing, it can be challenging. 'It’s not like breast cancer where there are lots of support groups, so it’s important that people with thyroid cancer know where their expert support is – from diagnosis . 'Patients with advanced cancer often don’t have the range of choices in terms of treatment and with rarer cancers it’s even harder. So these three drugs could become widely available on the NHS is good news.